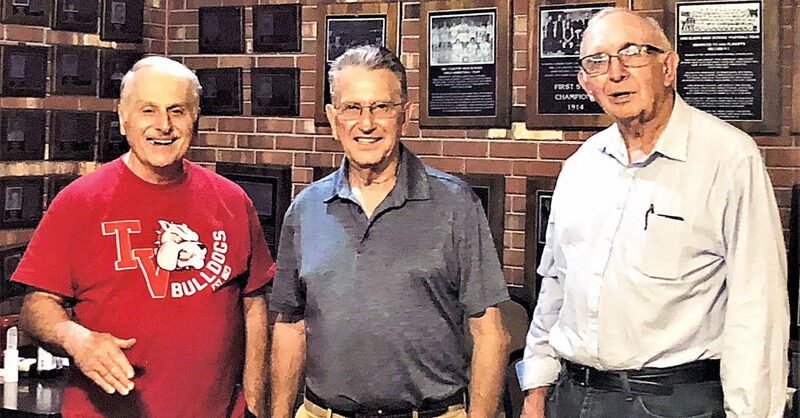 Attending the Tygarts Valley High School class of 1964 reunion are, from left, George Coussoule, Frank Channell and Fred Ware. Submitted photos Members of the Tygarts Valley High School class of 1964 attending the recent reunion are, from left, first row, Glen Rader, Peggy (Simmons) Church, Mary (Shiflett) Wamsley, Patricia (McCauley) Ware and Judy (Ware) Primavero; and second row, Charles Church, Gary Channell, Tom Zirkle, Delbert Salisbury, Rueben Currence, Chris Ritter, David Matthew, Robert Tacy, Richard Judy, Danny McCloud, Frank Channell, Fred Ware and George Coussoule. 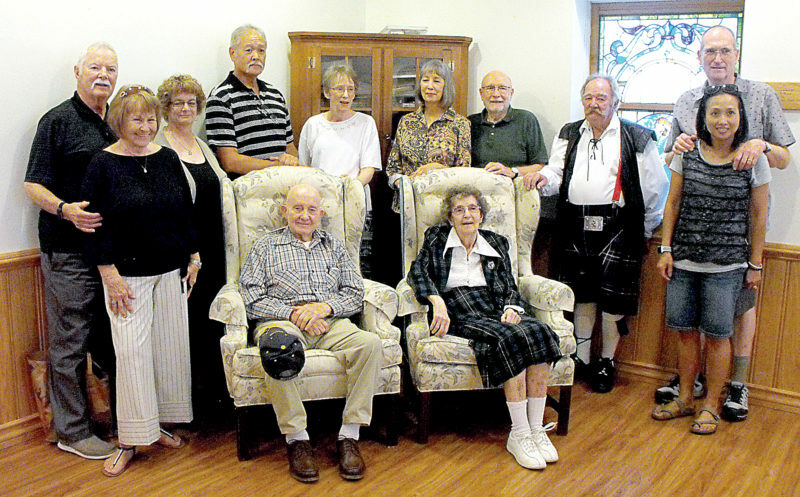 Another August came to the valley and several members of the 1964 graduating class of Tygarts Valley High School met at the Steer Steakhouse for an afternoon of socializing. 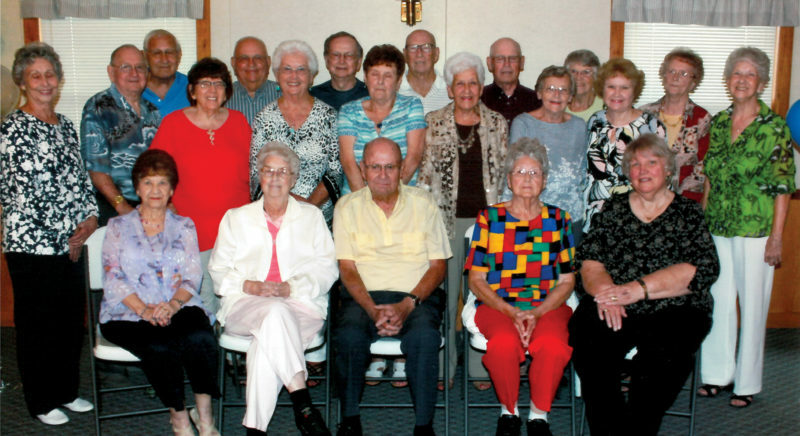 The group has been meeting once a year since their 50th class reunion. Fred L. Ware Jr. welcomed the group, and a moment of silence was observed for the loss of classmates Jerry Lee Haddix and Frances (Snelson) Wimer. Haddix had faithfully attended all gatherings of the class, and his classmates are saddened that he will no longer be “one of the boys” standing behind the girls in the class picture. Snelson/Wimer had moved to Texas where she raised her family and, from that distance, had not attended a class reunion. She will be remembered as one of the girls from Huttonsville who added to the number of females in the TVHS class of 1964. The class members of 1964 who live in the valley, or nearby, always look forward to seeing their classmates who live much farther away. Peggy (Simmons) Church and her husband, Dale, drive in from North Carolina. For Tom Zirkle the trip is made from Pennsylvania. Glenn Rader and his wife, Glenna, travel from Ohio. For several years, Chris Ritter has been driving to the gatherings from his mid-West home in Kansas. The blessing for the meal was given by classmate Glen Rader, and the afternoon was spent in conversation, discovering what was new since last year. It was learned that Peggy (Simmons) Church, though retired, has been called back to work three days a week, and she is loving it. Robert Tacy and his wife, Edna Mae (Stalnaker), are expecting their first great-grandchild very soon. In November, Gary and Carolyn (Corley) Channell will also become great-grandparents for the first time. Through the class grapevine, it was heard that Channell also spends a lot of time on the lawn mower. 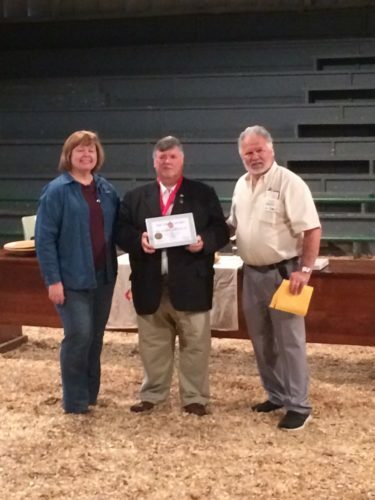 George Coussoule recently purchased a school, and he still teaches part time. Chris Ritter is still flying to China on business, and Danny McCloud’s only granddaughter will be marrying next April. Judy (Ware) Primavero bakes a great loaf of bread and enjoys volunteering at her church and for the grandmother program at school. Frank Channell has become an avid eBay and Amazon shopper, and Fred Ware is always “on the road again.” In big ways and small, the Class of ’64 moves right along. Channell also gave the treasurer’s report to the class, indicating that their heads were still above water. Adding additional funds to the class account were the proceeds from the afternoon raffle organized by Judy (Ware) Primavero. Tickets were sold for a large fruit basket prepared by Crazy Harry’s and an art print of Tygarts Valley High School donated by Channell and his wife, Carolyn. Winning the fruit basket was George Coussoule, a connoisseur of any fruit that grows. The TVHS print was won by Robert Tacy who proudly displayed it to the class. As the afternoon ended, a committee was formed to plan the 55th reunion for the class of 1964. Volunteering for the committee were George Coussoule, Richard Judy and David Matthew. The class looks forward to another August and what the committee will plan for them in 2019, especially since Judy and Matthew have already planned a very successful reunion in the past. With Coussoule on the committee, the class expects it will be spectacular.